Just in case you missed yesterday’s post, here it is in a nutshell. every morning at 6:00 am central time. And the reason is I don’t have any more room. but it is 8-10 yards of browns, carmels and other yummies. Assorted yardages that will fit right at home for the right quilter. loves Brown as much as I do. three years. I am up to my last few charms thanks to a blogger friend. I would love to win. I am hoping not to have the crazy fabric lady estate sale but it may happen if I don't get sewing. I agree whole-heartedly! Never too many browns in a girls stash! I love browns and need another selection to add to a "Leaders Enders" project I have been working on for a few years. 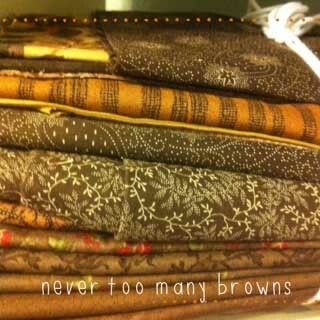 I can honestly say, I only have 2 brown fabrics in my stash. It's the one color I'm really lacking! Great opportunity – thanks! Browns are really lacking in my stash! I'll help you out by taking yours.